Diagnosed with melanoma, Mark Schoonover's skilled surgical team at Mayo Clinic Health System in Eau Claire used a precise technique called Mohs surgery to remove all the cancer while sparing as much healthy tissue as possible. "Melanoma. That really got my attention." That's how Mark Schoonover, of Weynerhaeuser, Wisconsin, describes the moment he learned he had skin cancer in August 2015. 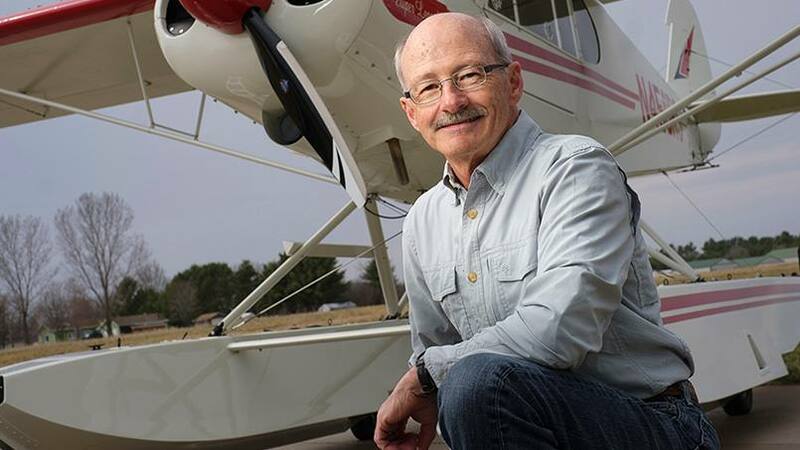 Mark, an avid pilot and outdoorsman who looks forward to clear skies, says he didn't always remember to protect his scalp from the sun as his hair started to thin and recede. He began making annual visits to a dermatologist when he was in his mid-50s. Previous biopsies had not revealed any skin cancer. But in 2015, Mark's family became concerned about a dark spot on his scalp that was growing larger. "I couldn't see it," Mark says. "My family felt strongly that it wasn't right." He and his wife visited his dermatologist. This time, a biopsy revealed melanoma, and the dermatologist recommended Mohs surgery. Mohs surgery, named for Dr. Frederic Mohs, the surgeon who pioneered the procedure in the 1930s, is a technique used to remove skin cancer while leaving as much healthy tissue as possible untouched. The procedure is typically used for cases where the affected area is visible, such as on the face, neck or head; in particularly sensitive areas of the body; or if the margins of the tumor are poorly defined, as was the case with Mark's tumor. "We cut out a thin layer of the tissue. Then we examine it and determine whether we got all of the cancer or if we need to cut out more." — Michael Colgan, M.D. "We cut out a thin layer of the tissue," says Michael Colgan, M.D., the dermatologist who performed Mark's surgery at Mayo Clinic Health System in Eau Claire. "Then we examine it and determine whether we got all of the cancer or if we need to cut out more." Mohs surgery is often used in cases of basal cell carcinoma or squamous cell carcinoma, Dr. Colgan says. About half of those patients only need one attempt to clear the tumor, which takes about two hours from start to finish. Few patients need more than two attempts. The edges of melanoma tumors are more difficult to define, though, and Mark required three sessions to achieve the desired result. It takes a skilled team to coordinate Mohs surgery. Scheduling nurses call patients to explain details and answer any questions. Surgical technicians meet patients at the clinic and guide them through the day from beginning to end. A pair of key team members remains out of sight: the histotechnicians. They prepare tissue samples for the physician to examine after each layer of tissue is removed. "They're the unsung heroes," Dr. Colgan says. With this experienced team, Dr. Colgan performs around 1,000 of the procedures each year. Read more about Mohs surgery.